guide from Lombok we found our driver and arrived at “Sunset House” where we were greeted warmly by the staff who remembered us from previous years. One of the nice waiters Ryan had died of an illness the previous year which was very sad as he was only 28 years old and his wife had given birth to their first child after he died and had gone home to her family in Java. Another waiter Charles had moved on and started his own transport business so we were able to give him some business during our week’s stay. Given the direct flights from Perth we expected Senggigi to be busier than in previous years but this was not yet the case. The Senggigi area had not changed a lot in a year with the same restaurants and bars and tour companies selling trekking trips to Mt Rinjani and trips to see the Komodo Dragons on another island. 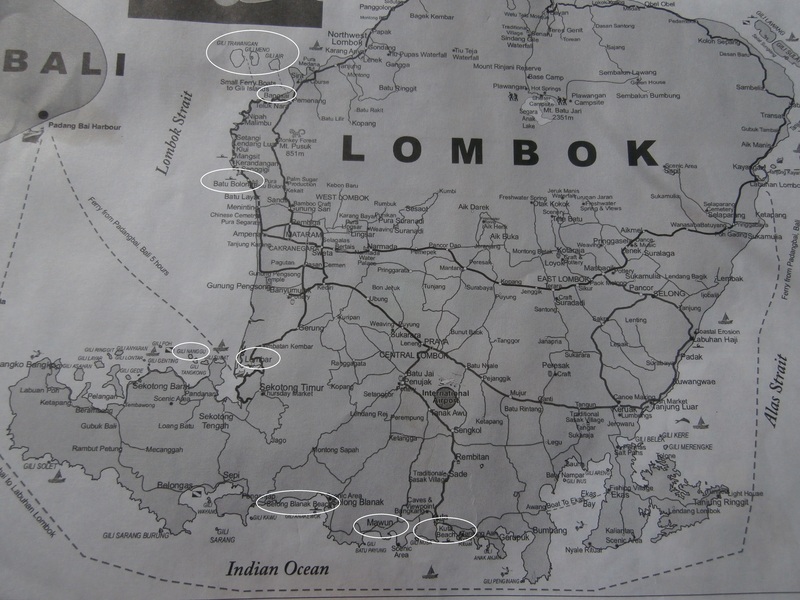 Lombok is very rural in nature even near the towns and the main city of Mataram which has one large mall and a lot of government buildings. We spent the week walking and swimming in the ocean and pool and made a couple of trips via the interior to the south coast where the most beautiful beaches are found especially one called “Tanjung An”. We saw only one upmarket resort and several home stays and a few restaurants in the vicinity. There were apparently some foreign and local built structures built very close to the beach at Kuta Beach but these were not supposed to be constucted on the beachside of the road and so the authorities had them all demolished. Unfortunately the remnants and rubble from many of the buildings remain which is not such a pleasant sight. The trip through the hills to the south coast was a quiet one with very little traffic of any kind on the road and villagers were harvesting and threshing rice. We stopped for coffee at a very high point with a spectacular view of the coastline at a yoga/restaurant centre called “Ashtari”. There were bunches of soya beans and rice drying in the sun as well as bright yellow corn and in one area there was a small version of an open cut gold mine and many small holdings where the large rocks where being broken down by old hammermills. We also passed many small brickworks along the roadside. We were told that 10,000 bricks cost around 700,000 rupiah or about $68. The burial structures in the Chinese cemetery are very ornate, some with figures in front of the “armchair” style graves. Most are well tended and the cemetery is quite large and on both sides of the road. Another day Charles who is from Flores island suggested we take a trip to Gili Nanggu off the south western tip Lombok. We took a very nice lady Lisa (who was staying at the same hotel) with us who had been a few days previously and who had thoroughly enjoyed the trip. The drive took us about an hour and a half and then Charles organised us a local boat to take us to the island. We had snorkels and masks and we filled several empty plastic bottles with bread and sea water and took them into the shallows. When we squirted the mixture into the water the fish appeared from nowhere to eat the bread. We then went snorkelling and saw a wonderful variety of colourful tropical fish and a fat, bright blue starfish. The coral there was largely dessimated but there were a few patches colour still to be seen. The island has one small bungalow hotel but they had a good outdoor area and for 5000rupiah (50cents”) we could have a fresh water shower and change before we went back to Lombok. We saw several pearl farms in the distance on the way back. mattress and sleep for the entire journey which a lot of the locals seem to do. There is also a snack bar on board selling mainly crisps and cool drinks. We departed from Lembar harbout at 9.10am (precisely) for the 4-5hour ferryride back to Padang Bai and Candi Dasa on the east coast of Bali. The ferries are not the Queen Mary and there is no airconditioning however for only $4 it is a leisurely trip. We sat in the shade on one side of the boat and there was a lovely breeze all the way. There was a bit of a swell for some of the trip and we rolled a bit but it was a lovely day and the ocean was sparkling. Several of the locals had fishing lines trawling behind the boat but we didn’t see any fish caught. We did see a very large pod of dolphins on the way. I used the time productively writing the blog and sorting photos and the trip went surprisingly quickly and we arrived in Padang Bai harbouron the east coast of Bali four and a half hours after we had left Lombok. We were picked up by our friend Wayan who broughtour larger bags which we had left in storage in Ubud and he took us to “Pondok Bambu” in Candi Dasa for our 10day stay. We had attended a communion celebration for two of my cousin’s grandchildren on Sunday the 30th June which was more like a full blown wedding with a breakfast at the parent’s house,a change of outfits for the two girls 10 and 8years old,,lunch at a restaurant for over a hundred family members including a 4 piece band and a top table and many courses of food! We recovered at one of my other cousin’s houses on the plain at Sezze Scalo the next day before leaving for Roccamandolfi. We detoured to drive up to Montecassino an abbey which was completely destroyed by the American bombs during the second world war and later rebuilt to it’s present state by the Germans. It was like coming home when we arrived in Roccamandolfi on the 2nd July. and then up the 250 steps to the house again. Giulia and Liberato our Rocca friends came to lunch on Saturday which we all enjoyed followed by a quiet day on Sunday. The window boxes and potted flowers dotted all around the town are very pretty and for most residents these are the only plants they have as the lie of the land doesn’t allow it. The weather has been a bit changeable but on the whole it has been warm and sunny with cool nights. A lot of the older people in the village venture out in the late afternoon with their walking sticks to walk along the flatter places in the town although there aren’t too many of them. On the occasions that we have gone for a walk after lunch the whole village seems deserted while everyone else has their siesta. July and August are festival months and we will be back here for two of them in July. Maurice drove us into the large town of Campobasso to celebrate my birthday. We both had some retail therapy. When I was buying something in a boutique an older man came in and I asked him directions to a restaurant that was well written up on “trip advisor”. He said straight away “why do you want to go there – it is very expensive”and so he recommended a typical “casareccio” home cooking trattoria in the old part of town where he said we could experience true Molise cooking at a very reasonable price. We were all for it and when we said we were in a campervan he said that he would show us where to park for free and how to get to the restaurant. He proceeded to get his car and guide us to the parking area. When we got out he said that it would be easier for him to take us to the place and so we got in his car and he zoomed around the streets to show us how we should get back to the car and then dropped us in front of the trattoria “da concetta”. He told a man who was at the entrance to look after us to which he replied that he was a guest at the trattoria. Unperturbed he wished us a good meal and off he went. Such a lovely man. He also told us that we must go to Oratino (a small mountain top village) on the way back to Roccamandolfi as the views were superb. entree and two for main course. We had between us pasta soup with lentils, Crunchy pieces of polenta with chicory, eggplants topped with fresh mozzarella and and the tastiest cherry tomatoes followed by home made sausage and pork steak with delicious fresh lettuce salad. To top it off it was also the cook’s son’s birthday and his sister had made the most delicious torta so we shared a piece of that. This was all accompanied by their most expensive red wine which was very good. The whole meal cost us 60euros! We then visited the Fiat service workshop to get some oil and a spare fuel filter and went back to the shopping centre where we delivered a bottle of the red wine to the salesgirl whose father had given us the lift and the restaurant recommendation. About 6.30pm we travelled about 6kms to Oratino to have a look at the town and the views and we were not disappointed. It was a beautifully kept hilltop village with a lovely small piazza and a park with fountain overlooking all of the surrounding countryside. Just beautiful. We sat at a bar and had an Aperol aperitif with tiny diamonds cheese sandwiches (not that we needed them but they came with the drinks) and a packet of crisps. This came to a total of 11euros. Australia for drinks I’m sure they could afford to do the same and it is a nice gesture which does not cost much. The day had been nice and sunny and we were surpised to find our towels sopping wet when we got back to Roccamandolfi. It had obviously rained very hard there. The next few days were also unseasonal – warm but with afternoon storms and intermittent rain. We had a couple of very frustrating days trying to book flights with credit cards where the banks (although we had advised them) that we were travelling overseas and needed to effect some transactions did their best to block our payments. We have decided to leave the van here in Roccamandolfi for the winter before we travel towards the warm of India, the middle east and Asia again. On Friday the 12th July we drove via a very scenic route through the mountains to a small town of about 400 called “Salle” on the way to Chieti where my school friend Anita,her parents, sister and niece had come from Perth the week before. The entrance to the town with a bridge over a wide chasm of limestone with a river running through the centre is spectacular. There is only one bar and a two small shops in town and a pharmacy. A couple of kilometres away is a wonderfully restored castle where the old town of “Vecchio Salle” was previously located. It was destroyed by an earthquake in 1932 and there is now practically nothing remaining of the old town which was renowned for the production of strings for violins, guitars and surgical sutures. We went up to the castle one night for a concert and it was lovely sitting outside in the castle grounds which were lit up. The castle now houses a restaurant. When we got out of the car in the dark the bushes were twinkling with fireflies which I had only seen once before in Gemany. There were hundreds of them and it was like having fairy lights all over the countryside. The following day Anita, Maurice and I drove an hour down to “Sulmona” which is a town famous for the sugared almond and chocolate “Confetti” used all over Italy and abroad. We were taken on a tour of one of the companies. It was very “state of the art” with over 40 copper drums and other large drums in which the confectionery was made. The showroom consisted of confettis made into every kind of flower, animal and other items. This company which only employed ten workers only services the local communities and their main export was to Greece and containers of the confetti to Libya of all places. We went into the historical side of town and had a walk around before having a wonderful lunch in a michelin starred restaurant called “Ristorante Gino”. The meal and the service were second to none. We made our way back over the mountain roads to Salle which was about 50minutes away. Like Roccamandolfi the population of the town is much reduced with many residents moving away for work over the years. The following day the 14th July we took part in the tradition called “the pied piper” whereby the Lord Mayor and residents in traditional costumes walk around the streets of the town in procession and other residents who who have cakes, sweets, wine, cheese, olive oil etc bring these along and join in the procession to the main square where many tressle tables were set up to take all of the produce. This was then sold to anyone who wanted to buy the wonderful array of produce. The procession nearly didn’t take place as sky was full of black clouds and we had a torrential downpour for a couple of hours around lunch time. The event was scheduled to start at 5pm but luckily the rain passed and the sun came out. We bought some lovely wine and local olive oil and at an art exhibition we bought a small painting by a local artist who at 86 is still painting. We went back to where our friends were staying to have a tradional meal of “porchetta”- from three pigs which had been roasting on the spit in the square. In the morning Maurice and I walked down to the bridge and back and then left Salle on the 15th July and the wonderful hospitality from Anita and her family. We again took the lovely scenic mountain route north east via Terni and Perugia to see Mary again at her home near “Greve in Chianti”. Mary has two Australian carers at present Jude and Joan and we had a lovely meal outside overlooking the beautiful Tuscan countryside. The next day we went with Mary to lunch at “Le Panzanelle” in Lucarelli and had a tasty meal in the garden area. We played scrabble in the afternoon which I really enjoyed not having played it for such a long time. Maurice, Jude and I went into Greve the following day and wandered around the quaint town and Maurice and I both managed to buy some shoes. We had some lunch at the Coop trattoria and went back to the house. Mary’s car had been taken away by the mechanic the previous day and she had had bad news about it so Maurice, the mechanic and Mary left in the early evening to go over to the other side of Florence to look at a year old Peugeot which Mary did buy. It was handy to have Maurice along and with his Samsung Tablet he was able to use Google translate to ask the salesman many questions. We left Mary and the girls on the 18th July and drove 5hours to the “Passo San Leonardo” near Sulmona to have lunch with Anita and her family. The meal was delicious – again home style cooking and some interesting food such as the stems of garlic plants which had been marinated and fried. We saw a large number of young hikers coming down the mountain and I thought it was a flashback to the “Sound of Music” when I saw two nuns walking down the slope! They were accompanying the children on their pilgrimage to somewhere and all stopped for a drink at the restaurant which was also a hotel and round in shape. We set off on about 5.30pm for the 3hour trip back to Roccamandolfi.